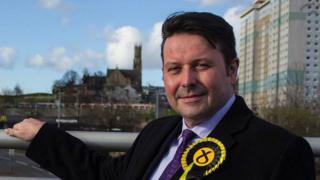 Westminster's standards watchdog has opened an investigation into the conduct of SNP MP Phil Boswell. It came after allegations that he breached parliamentary rules by failing to register financial interests. A complaint was reportedly made alleging Mr Boswell did not properly record his directorship of Boswell and Johnston Ltd. The SNP said the inquiry did not imply the Coatbridge, Chryston and Bellshill MP broke the rules. The allegations against Mr Boswell were made by a Liberal Democrat candidate. The parliamentary commissioner for standards, Kathryn Hudson, has several options open to her, including throwing the complaint out or referring it to the Commons standards committee for further investigation. Labour and the Conservatives called on SNP leader Nicola Sturgeon to launch an investigation of her own into the issue. In December, Mr Boswell, who worked in the oil and gas industry before being elected, admitted benefitting from a tax loophole by receiving an interest-free loan of £18,000 while working for US energy company Phillips 66 - something he called a "common practice" in the industry. The SNP then said the MP had always declared his interests in line with guidelines, and was "committed to ending tax avoidance schemes". On Tuesday afternoon, a spokesman said: "Phil Boswell sought advice from the Register of Interests and as the rules set out by the Commissioner for Standards make clear, their inquiry does not imply that there has been a breach of the rules of the House." Two SNP MPs - Michelle Thomson and Natalie McGarry - are currently suspended from the party after withdrawing from the whip. Ms Thomson has been linked to property deals that led to a solicitor being struck off, while Ms McGarry is at the centre of a police investigation into claims that donations made to the Women for Independence group have gone missing.